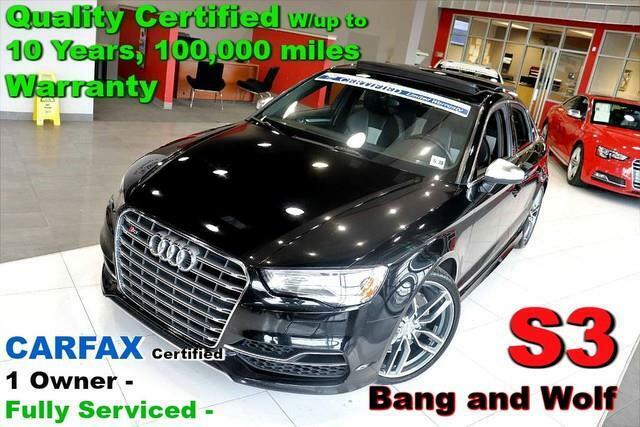 CARFAX Certified 1 Owner - Fully Serviced - Quality Certified W/up to 10 Years, 100,000 miles Warranty This 2015 Audi S3 2.0T Premium Plus - Quattro - Premium Plus - CARFAX Certified 1 Owner - Fully Serviced - Quality Certified W/up to 10 Years, 100,000 miles Warranty is offered to you for sale by Quality Auto Center. This Audi includes: BLACK/TITANIUM, LEATHER SEATING SURFACES Leather Seats CONVENIENCE PACKAGE Auto-Dimming Rearview Mirror Heated Mirrors Power Folding Mirrors FULL LED HEADLIGHTS Automatic Headlights Daytime Running Lights MYTHOS BLACK METALLIC BANG & OLUFSEN SOUND SYSTEM Premium Sound System DRIVER ASSISTANCE PACKAGE Rear Parking Aid Back-Up Camera Blind Spot Monitor RADIO: AUDI MMI NAVIGATION PLUS W/MMI TOUCH Navigation System AM/FM Stereo Satellite Radio S SPORT SEAT PACKAGE Heated Front Seat(s) Bucket Seats 19 PERFORMANCE PACKAGE Tires - Front Performance Aluminum Wheels Tires - Rear Performance Active Suspension *Note - For third party subscriptions or services, please contact the dealer for more information. * If you're going to purchase a pre-owned vehicle, why wouldn't you purchase one with CARFAX one-owner report. Is it possible to fall in love with a vehicle? It is when your vehicle is as prestige as the Audi S3. Everyone hates the gas pump. Skip a few gas stations with this super fuel efficient AudiS3. Comfort. Performance. Safety. Enjoy all three with this well-appointed AWD 2015 Audi. Marked by excellent quality and features with unmistakable refined leather interior that added value and class to the Audi S3 Enjoy the drive without worrying about directions thanks to the built-in navigation system. All records are included with the purchase of this well-maintained pre-owned vehicle. If not for a few miles on the odometer you would be hard-pressed to know this 2015 Audi S3 is a pre-owned vehicle. If you're looking for world-class speed, acceleration, cornering and handling, don't blink because you'll miss this truly amazing automobile. This wonderfully appointed vehicle comes equipped with the options and features every driver craves. With new tires, this vehicle is ready for miles and miles of driving. Premium paint with no visible signs of damage or degradation is another reason to consider this Audi S3 2.0T Premium Plus - Quattro - Premium Plus - CARFAX Certified 1 Owner - Fully Serviced - Quality Certified W/up to 10 Years, 100,000 miles Warranty. This rare vehicle is a prime example of automotive engineering perfected. Upgraded wheel package makes this Audi S3 stand out from the rest. More information about the 2015 Audi S3: The reinvented Audi A3 is poised to make a big splash in the compact sedan segment. The A3 abounds with attractive athleticism, and it pioneers and technology features such as a 4G LTE data connection and an advanced multi-media interface. Against the likes of the Mercedes-Benz CLA250, it more than holds its own and the overall package makes it hard to ignore. Strengths of this model include superior craftsmanship, Innovative technologies, all-wheel drive, performance, and cabriolet, clean diesel and potent sport sedan models No Credit / Bad Credit / No Paystubs, No problem !! ! All Approved ! Everyone drives ! CLEAN, GORGEOUS, LOW MILES, SHOWROOM CONDITION. CALL NOW QUALITY CERTIFIED up to 10 YEARS 100,000 MILE WARRANTY , To Certify a vehicle, there will be an additional cost for Certification. CALL NOW For details. STUNNING AGGRESSIVE LOOK ON THIS BEAUTIFUL--Call today to schedule a test drive... Good Credit/Bad Credit/No problem!!!! Get paid cash? No problem!! 100% Credit Approval with interest rates starting at 2.49% for qualified customers, our rates will not be beaten. We price our cars at wholesale price to guarantee the best deals for our customers. Our inventory moves quick, please call to confirm the availability of the vehicle of your interest Springfield location 973-564-0112. This vehicle is located at our SPRINGFIELD location. Come visit our new showroom in Springfield NJ. Contact Quality Auto Center today for information on dozens of vehicles like this 2015 Audi S3 2.0T Premium Plus. Pull up in the vehicle and the valet will want to parked on the front row. This Audi S3 is the vehicle others dream to own. Don't miss your chance to make it your new ride. The greater your fuel-efficiency, the less your carbon footprint. And with exceptional MPGs, this Audi S3 treads ever so lightly on Mother Earth. This AWD-equipped vehicle handles well in any weather condition or terrain. You'll benefit from superb handling, improved steering and excellent acceleration. More information about the 2015 Audi S3: The reinvented Audi A3 is poised to make a big splash in the compact sedan segment. The A3 abounds with attractive athleticism, and it pioneers and technology features such as a 4G LTE data connection and an advanced multi-media interface. Against the likes of the Mercedes-Benz CLA250, it more than holds its own and the overall package makes it hard to ignore. Interesting features of this model are superior craftsmanship, Innovative technologies, all-wheel drive, performance, and cabriolet, clean diesel and potent sport sedan models No Credit / Bad Credit / No Paystubs, No problem !! ! All Approved ! Everyone drives ! CLEAN, GORGEOUS, LOW MILES, SHOWROOM CONDITION. CALL NOW QUALITY CERTIFIED up to 10 YEARS 100,000 MILE WARRANTY , To Certify a vehicle, there will be an additional cost for Certification. CALL NOW For details. STUNNING AGGRESSIVE LOOK ON THIS BEAUTIFUL--Call today to schedule a test drive... Good Credit/Bad Credit/No problem!!!! Get paid cash? No problem!! 100% Credit Approval with interest rates starting at 2.49% for qualified customers, our rates will not be beaten. We price our cars at wholesale price to guarantee the best deals for our customers. Our inventory moves quick, please call to confirm the availability of the vehicle of your interest Springfield location 973-564-0112. This vehicle is located at our SPRINGFIELD location. Come visit our new showroom in Springfield NJ.